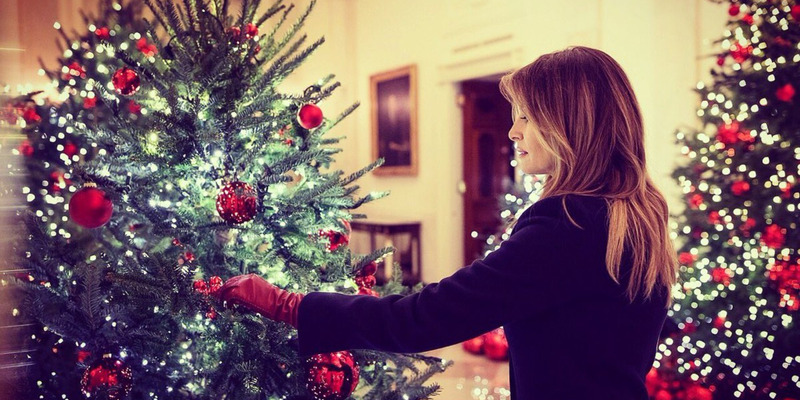 via @FLOTUS/TwitterFirst lady Melania Trump adjusts an ornament on one of the hundreds of White House Christmas trees. December means homes across America are decking the halls, and the nation’s most famous address is no exception. The White House halls have been decked for the holidays every December since John and Abigail Adams held the first White House Christmas party in 1800. The decorations have only gotten more elaborate with time. 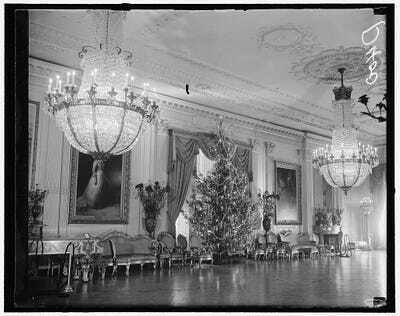 These photos show how White House Christmases of years past compare to today. It’s the most beautiful time of the year at the White House. 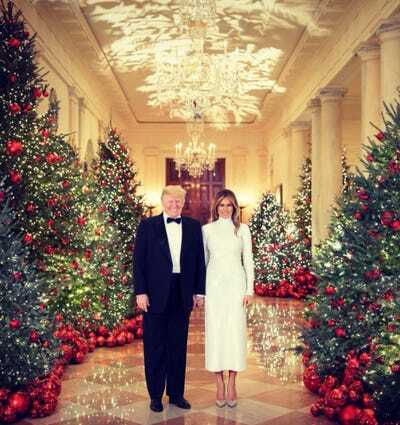 The West Wing, East Wing and every room in-between have been decked out in elaborate decorations to celebrate the holidays, and President Donald Trump and First Lady Melania are preparing to celebrate the holiday with their family. This year’s official theme is “American Treasures,” for the latest round of holiday decorating to take over 1600 Pennsylvania Avenue. 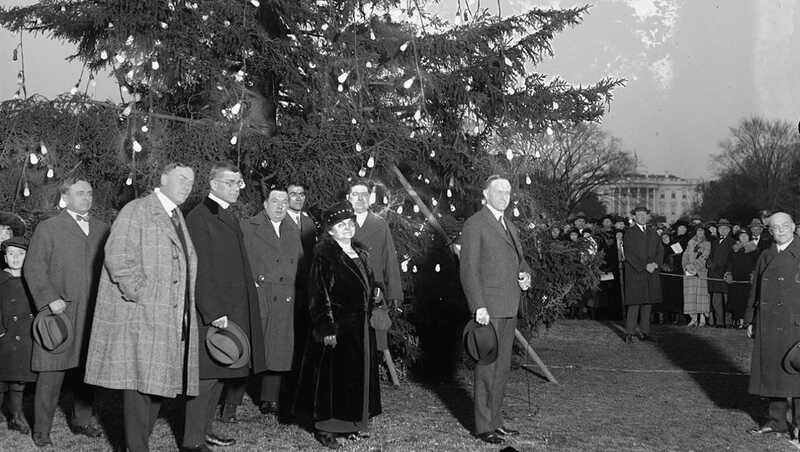 Here’s a look back at presidential Christmas celebrations, going all the way back to the 1800s. Every president has brought their own traditions into the White House. 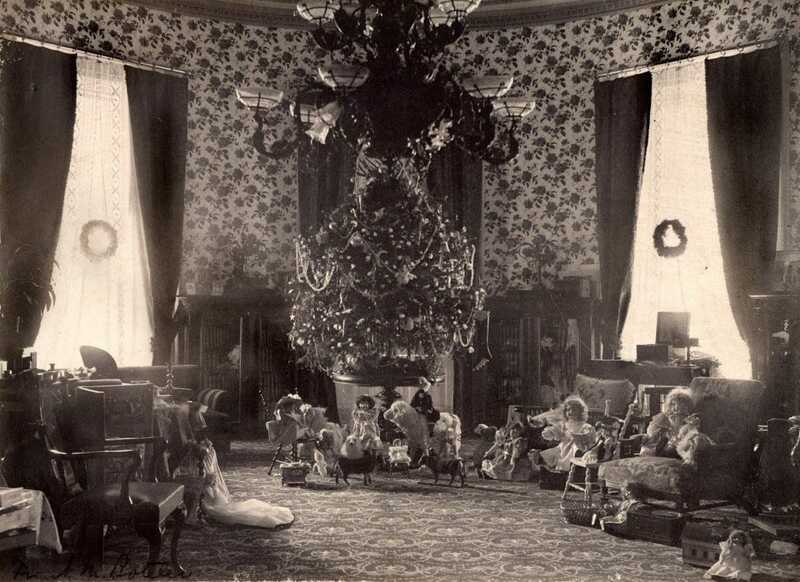 Grover Cleveland, for example, lit up the first Christmas tree inside the White House to the delight of his young daughters. White House Historical AssociationThe Cleveland Family tree in the second floor Oval Room of the White House. Calvin Coolidge was the first president to host a public Christmas celebration at the White House, with the first National Christmas Tree lighting in 1923. 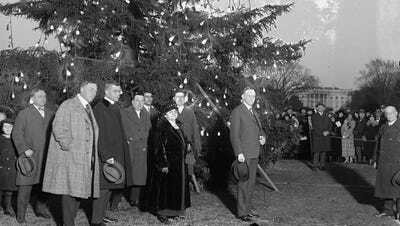 The tree lighting ceremony and the president’s participation has been a yearly tradition since then. 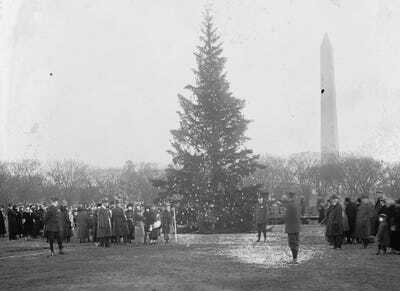 Library of CongressThe 1929 National Christmas Tree. Glowing trees lit up a side entrance to the White House in 1931. 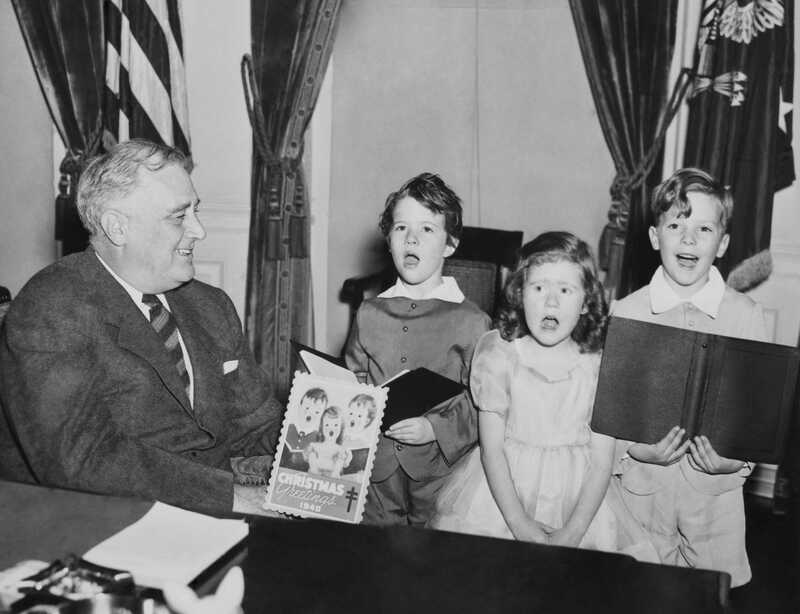 Franklin Roosevelt spent ten consecutive Christmas holidays in the White House and emphasised the importance of family during the holiday season. Children joined Roosevelt at the White House to ring in Christmas 1940 with Christmas carols. President Harry Truman welcomed some unusual guests to the White House for December 1948 when he was gifted turkeys for his Christmas dinner. Here, President Dwight Eisenhower and first lady Mamie Eisenhower pose with their family in 1958 on the Christmas tree-lighted North Portico of the White House. 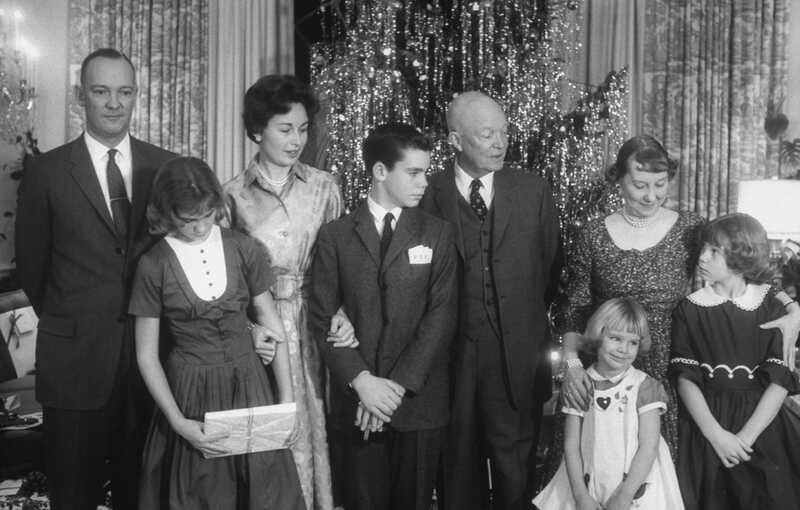 Eisenhower’s first family also posed for a Christmas Eve picture in front of a tinsel-covered tree. First lady Jacqueline Kennedy began the tradition of themed White House decorations with Tchaikovsky’s “Nutcracker Suite” taking over the Blue Room in 1961. Here, first daughter Caroline admires the tree before a party for employees. 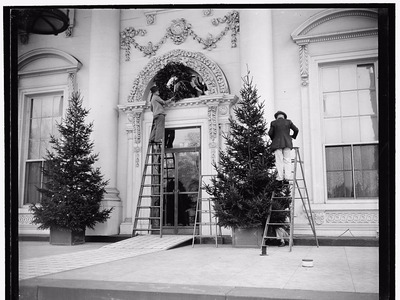 In 1962, the White House Christmas tree was decorated with ornaments inspired by children, including candy canes and gingerbread cookies. 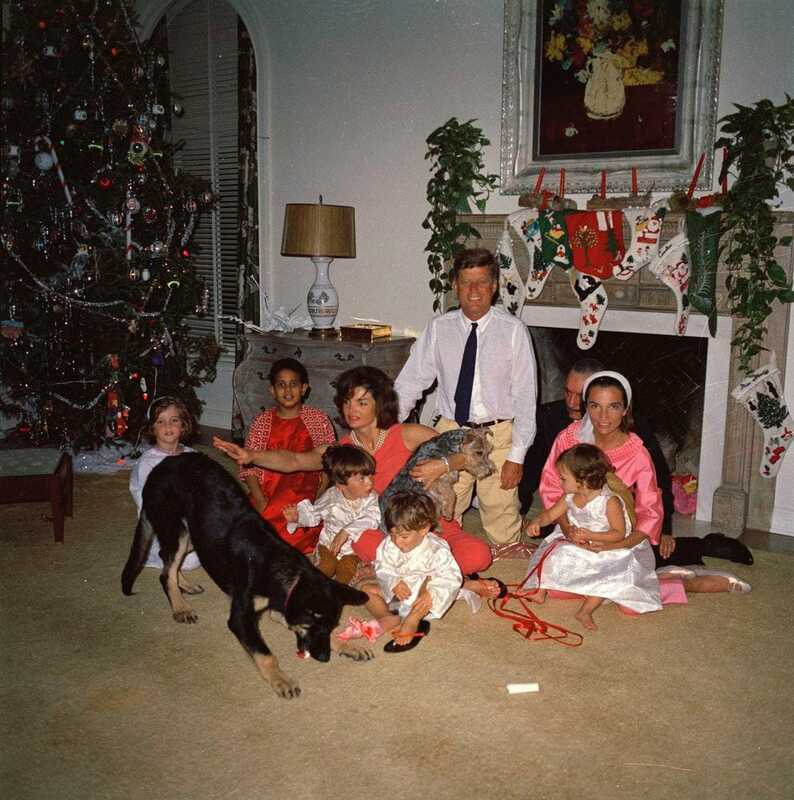 Despite Jackie’s decorating efforts, the Kennedy family chose to celebrate Christmas Day in Palm Beach. A banner with a holiday sentiment was hung for the annual Christmas Pageant of Peace on the Ellipse, in front of the White House, in 1963. Flags were ordered to fly half-mast through December, mourning the November death of President Kennedy. 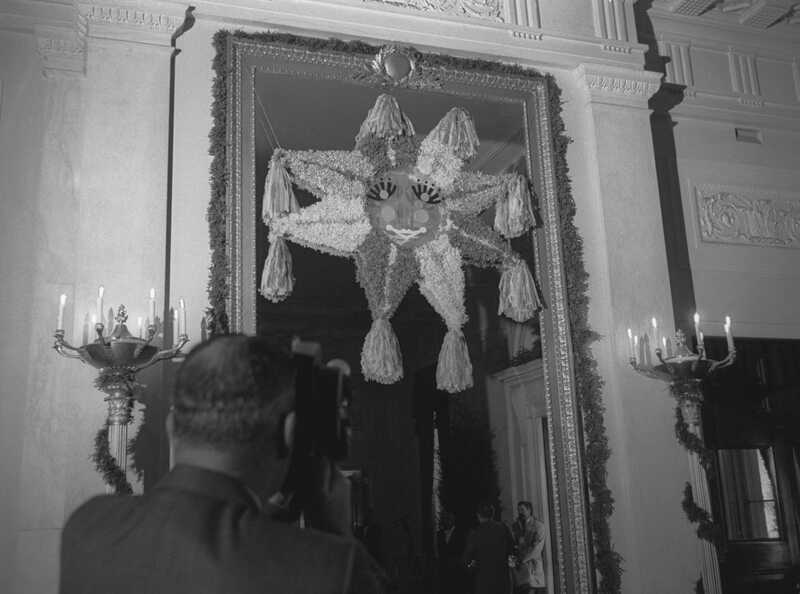 The Johnson family included a five-foot red, green, and gold piñata in the main hall. 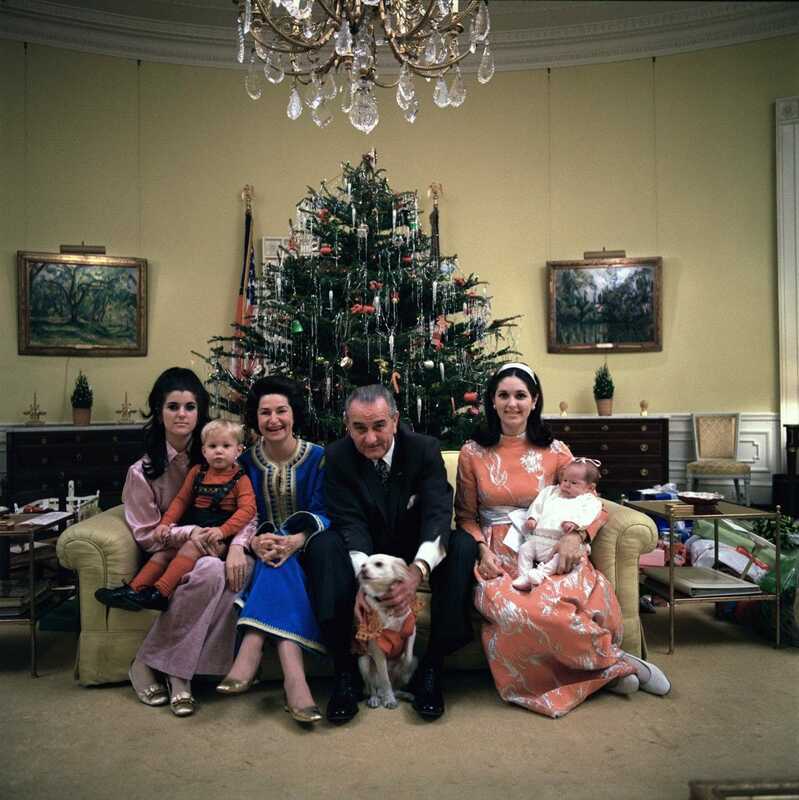 In 1967, President Johnson, Lady Bird, and Yuki, the White House dog, spent the holiday beside that year’s Christmas tree, a Norway spruce. Here, the Johnson family poses in front of a Christmas tree in the Yellow Oval Room. Christmas in the Nixon White House was a lively affair. 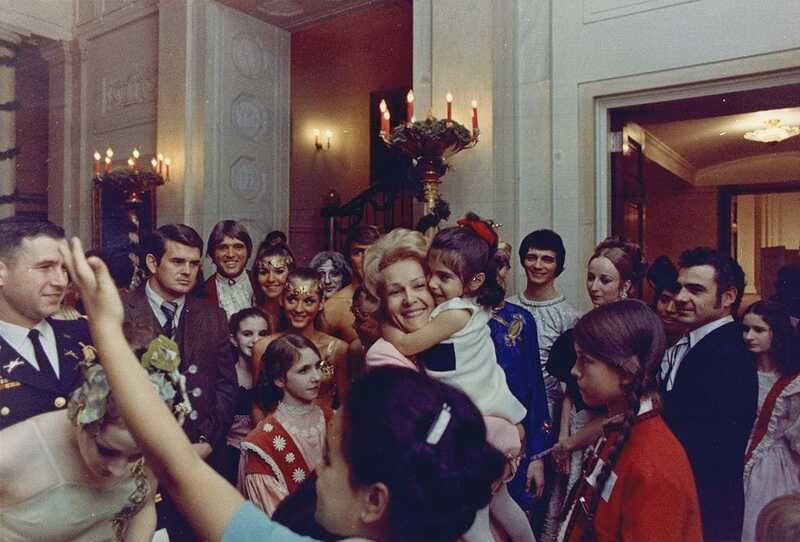 First Lady Pat Nixon told Empire Magazine their holiday traditions included the president playing “Rudolph the Red Nosed Reindeer” on the piano for friends and family. Another Nixon tradition was to decorate their Christmas trees with decorations made by disabled workers. The 1969 tree, dubbed the “American Flower Tree,” was decorated with velvet and satin ornaments featuring each state’s flower. 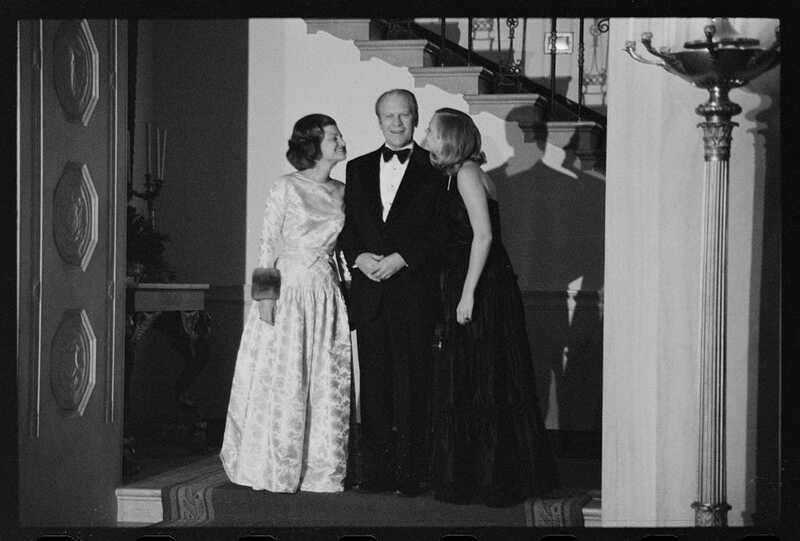 Gerald Ford brought two dates to the White House Christmas ball in 1975: his wife Betty and his daughter Susan. 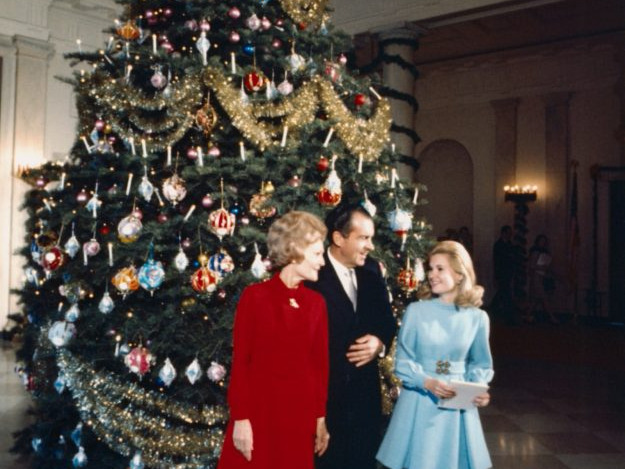 First Lady Betty Ford presented the official White House Christmas tree in 1976. At that year’s lighting, President Ford said that as a former National Parks ranger he was proud to have real trees throughout the White House. 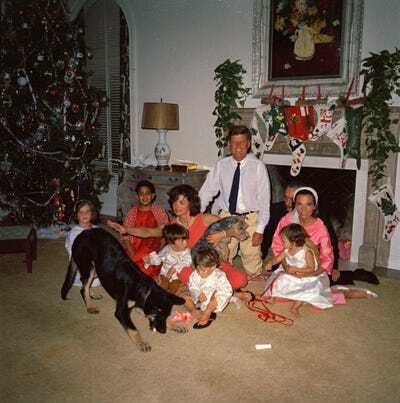 Many presidents have included their children and grandchildren in public White House traditions while in office. Jimmy Carter’s daughter, Amy, helped him light his first National Christmas Tree in 1977. 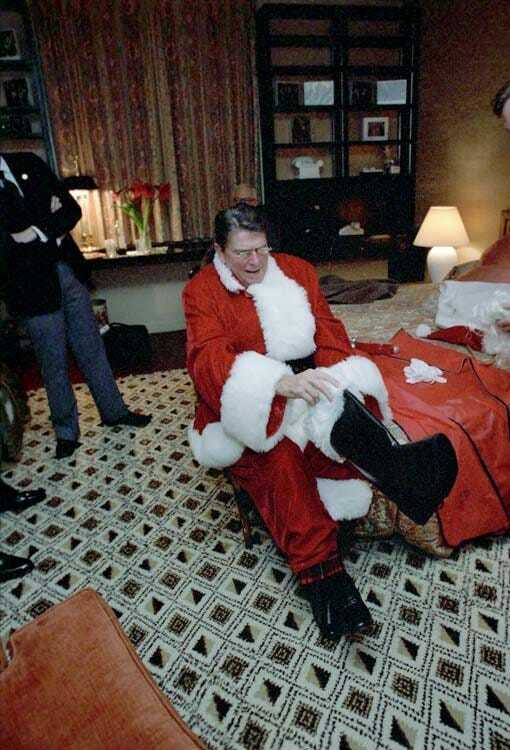 … and First Lady Nancy Reagan sat on a different Santa’s lap. 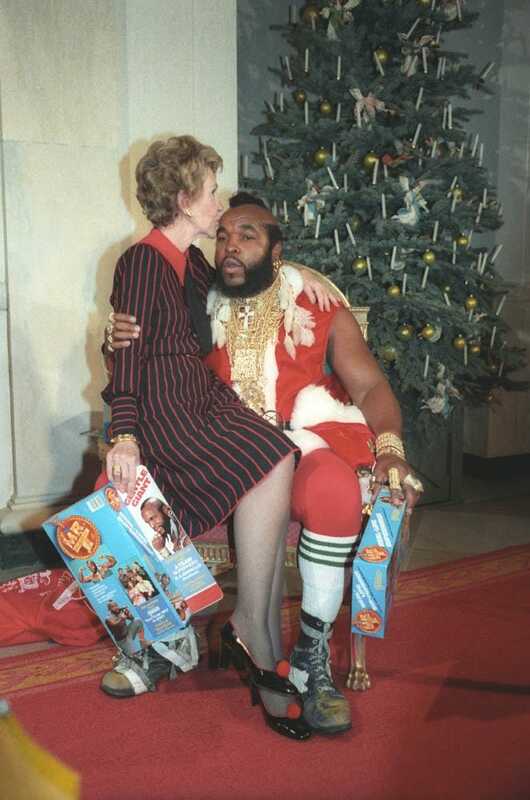 WikimediaNancy Regan sitting on Mr. T’s lap in 1983. 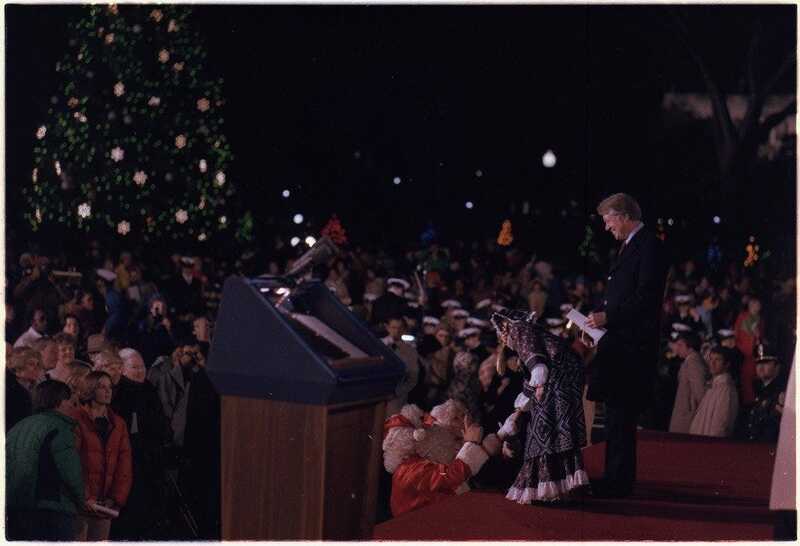 In 1984, then-second lady Barbara Bush helped place the star on top of the national Christmas tree on the Ellipse. 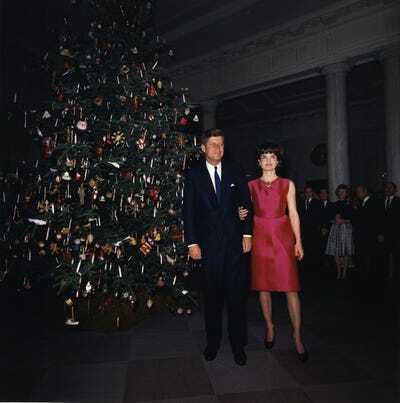 The Reagans also commissioned artists to paint scenes from inside the Executive Mansion during the holiday season for their annual Christmas card. Many presidents, including Barack Obama, Bill Clinton, and both George W. Bush and George H.W. Bush, have since followed suit. The Reagan White House incorporated pop culture into their playful decorations. Here, the first lady glances toward ALF during a children’s Christmas party at the White House. Christmas during the first Bush administration was a family affair. Here, George H.W. 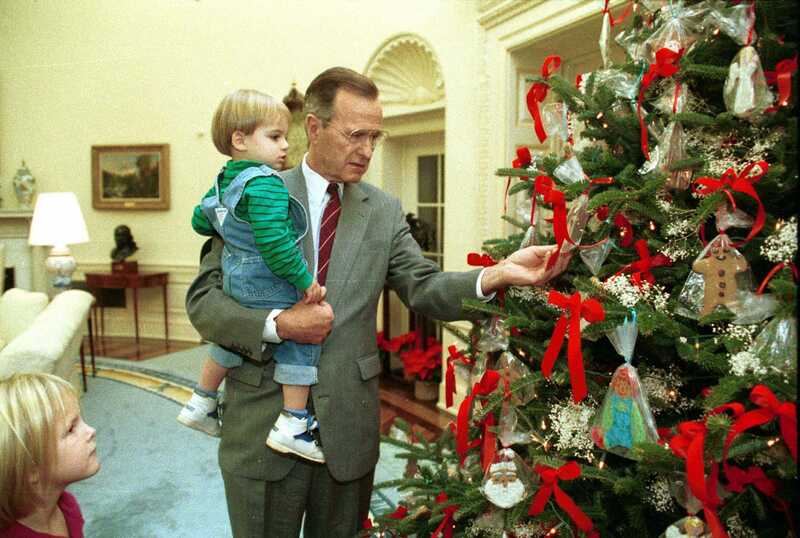 Bush shows his grandchildren the Oval Office Christmas tree in 1991. 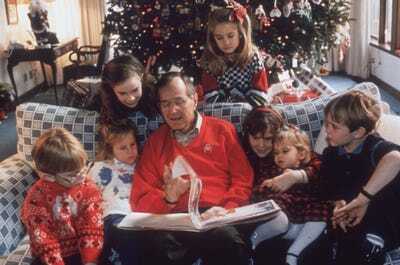 Bush’s grandchildren were treated to a story with the president when they spent Christmas Eve at the White House in 1991. 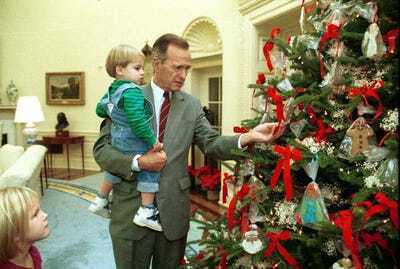 George Bush Sr. celebrated all four of his Christmases as president at Camp David, plus eight more holidays while his son was president. First lady Hillary Rodham Clinton adorned the 1993 Christmas tree with what she described as both “elegant” and “funky” ornaments. The Clinton White House had plenty of edible decorations each year. Over the course of several years, the Clinton’s enjoyed gingerbread house versions of the Washington Monument, Mount Vernon, and even a replica of Hillary’s childhood home. The Bush’s “Red, White and Blue Christmas” theme was inspired by letters the president and first lady received after September 11th. George W. and Laura Bush celebrated a patriotic-themed Christmas in 2008 to commemorate their final Christmas in the White House and the election year. The Obamas celebrated friends, family, and the freedoms enjoyed by Americans with their “simple gifts” White House theme. Barack Obama got really into the National Christmas Tree lighting in 2014. 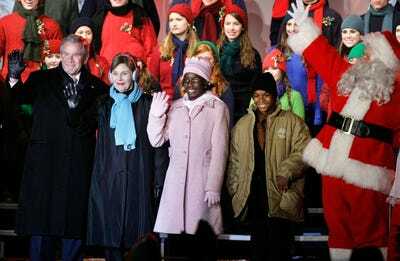 The president joined celebrities and Santa Claus on stage for a festive dance. For the Obamas’ last year in the White House, larger-than-life replicas of their dogs Bo and Sunny added a playful and personal touch to the decorations. The first Christmas of the Trump White House celebrated the theme “Time-Honored Traditions,” for which first lady Melania welcomed children for wreath-making. The official 2018 Christmas theme in the Trump White House is “American Treasures,” meant to honour the unique heritage of the country. According to the White House, more than 100 open houses and many receptions will happen through the month of December, and more than 30,000 visitors will see the decorations in person during public tours. “No matter one’s faith or beliefs, the Christmas season reflects all that is best in the American spirit,” Trump said at this year’s tree lighting. Official White House Photo by Andrea HanksThe Trumps’ official 2018 White House Christmas portrait.